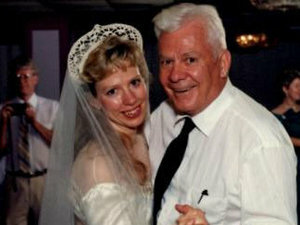 Barbara Mancini with her father, Joe Yourshaw. In 1971, Geertruida Postma, a medical doctor in the Netherlands, gave her mother a lethal injection of morphine. She could no longer watch her mother suffer the agony of a brain hemorrhage when she knew how to end it. For the next thirty years Dutch law had a gaping hole in it. Assisted suicide, defined as helping to take the life of a person–even at the person’s explicit request–was not legal; nor was it prosecuted. “He who takes the life of another person on this person’s explicit and serious request will be punished with imprisonment of up to twelve years or a fine of the fifth category,” read Article 293 of the Dutch Penal Code that rendered assisted suicide (or euthanasia or aid in dying) a criminal offense. And yet, the penal code also includes, in Section 40, a clause that ameliorates the assisted suicide prohibition. It states, in part, that “an individual was not punishable if he or she was driven ‘by an irresistible force’ (legally known as force majeure) to put another person’s welfare above the law.” Assisted suicide was legalized in The Netherlands in 2002. In 2010, 4,050 patients, roughly three percent of those who died, utilized the law. Also in 1971, Catholic pacifist Eileen Eagan first defined the “seamless garment,” a metaphor for our absolute duty to preserve the human body. It was incorporated by Cardinal Joseph Bernardin twelve years later into his “consistent life ethic”: that all human life is sacred and should be protected by the law. Absolutes have an enticing romance, particularly when discussed in the abstract. We hark them when we don’t have clear answers; they become fast laws that protect our consciences, our social mores, what makes us care for one another. But what is our duty when a life can’t be saved? Or when preservation of life comes at a terrible cost, either unbearable suffering for the patient, or an unsustainable use of medical resources? The principle that “all human life is sacred and should be protected” is then changed by individual circumstances, by the patient and their body, by varying conceptions of what is sacred and what must be protected. Erring on the side of life is an unquestionable principle. Until, perhaps, you’re standing where Postma was standing, watching your mother’s death drag her over the last coarse days of life. Or perhaps when you’re standing where many doctors stand today, watching terminal patients’ lives prolonged by treatments and machines that can no longer cure. What gets lost in the chasm between Bernardin’s “all human life is sacred” and Postma’s “irresistible force” is a world of definitions. What is life when death is the decision to remove a feeding tube? What does sacred mean to us today? What is suicide to an actively dying person? To their family? What is dignity in the face of pain? Even too, what is pain? Her father was revived at the hospital with the drug Narcan. He was given a urinary catheter and breathing mask, among other treatments. Barbara Mancini was arrested and released on $100,000 bail. Yourshaw died four days later in the hospital – after receiving morphine to ease his pain. Asking what our duty is when faced with situations like Mancini’s is not a thought exercise. Today in the U.S., assisted suicide, or what activists call Death with Dignity, is legal in four states. There are multiple initiatives to legalize assisted suicide at any given time. New drugs and treatments that can prolong death are developed constantly. As the US populations grows increasingly older and we watch our loved ones struggle with the “bad things” that medicine can now do, new understandings about how we die will continue to challenge each of us. The question is not whether we have the courage to imagine ourselves in Mancini’s place, but–as a society charged with formulating ethics, opinions, laws and policies–when each of us will be forced to. Ann Neumann, a hospice volunteer, has written for Guernica, the Nation, New York Law Review, and Religion & Politics, among others. She is contributing editor at The Revealer, a publication of the Center for Religion and Media at New York University, where she is a Visiting Scholar.